As my readers will well know, St. Philip Neri is my favorite saint and has been for a long while now. I take every opportunity I can to sing his praises on this blog, and today happens to be one of them. In Oxford, we are celebrating the Feast of the Patronage of St. Philip, a local solemnity that honors the canonical erection of the house here as a Congregation of the Oratory. Please pray for the Oxford Fathers on this, their silver jubilee. To celebrate, here is my favorite hymn to the Apostle of Rome – Pangamus Nerio, as sung by the choir of the Birmingham Oratory. It is the vesperal hymn of St. Philip. Unfortunately, I don’t have an English translation (nor the time and energy to translate from the original myself). Alas. May St. Philip Neri pray for Oxford, for the Oratorians there, and for all of us who call upon him in filial affection. A while back I produced a short post entitled “A View of the Sacraments in the Age of Enlightenment.” Here I give you another series of similar images, this time from the hand of Giuseppe Maria Crespi, also known as “Lo Spagnuolo.” These paintings from 1712, so reminiscent of Rembrandt, hang in the Gemäldegalerie, Dresden. Originally commissioned by Cardinal Pietro Ottoboni, that towering figure of late Baroque culture, they passed posthumously up to Germany, where they made their way into collection of the Elector of Saxony. Let me begin by saying that, as with the information in the above paragraph, all of the images can be found at Wikipedia. “Baptism.” Crespi’s sparing use of light demonstrates the central conjunction of the scene. Allowing our eyes to wander along the central line of illumination, we follow the arm of the priest pouring water on the head of the outstretched infant to the mother’s rosary-wrapped wrist just beyond. I am convinced that the use of light in all of these images is the key to their meaning. Crespi uses light to illustrate the work of sacramental grace, and darkness to emphasize the mortality, evanescence, and weariness of our ordinary world. “The people in darkness have seen a great light” – thus spake Isaiah. “Communion.” The priest’s face is shrouded in darkness, and rightly so. It is not he who offers the bread of life, but Christ in him. Interesting collar, too. Sure looks familiar. Cardinal Ottoboni was patron of the Congregation of the Oratory at Rome for some time, and it’s entirely possible that Crespi would have taken the Oratorians as his model here. Besides that, the setting of the scene is strikingly barren. Crespi’s choice to leave out the probable altar rail lends the scene an intimacy that captures the very heart of the worship here portrayed. “Ordination.” This composition is a swirling mix of blacks, browns, subtle golds, and occasionally, whites. The point that stands out most is the break in this overall scheme – the youthful, rosy visage of the ordinand, coupled with the slightly ruddy shadows that fall across his hand. What a contrast with the other figures, all of whom are shrouded in darkness and invested with a manifest pallor. Here is an image of youth, a prospect of renewal against a backdrop of dignified decay. “Extreme Unction.” At last we come to the end, the place of the skull. It is only fitting that Crespi should choose to depict a collection of Franciscans for this sacrament. Religious life is always a preparation for death. Yet the bright patch of light improbably illuminating the shoulder of the attendant friar contrasts starkly with the shadowy body of the dying father and points to new hope. 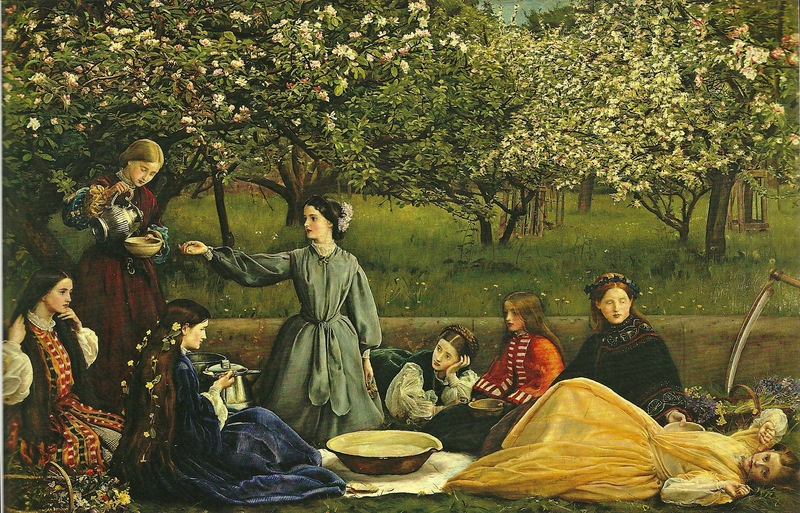 Spring is here, and the Pre-Raphaelites are going to tell you how to celebrate. If you’re not just lying about languidly in a meadow, you’re not really doing it right, are you? It is also acceptable to lie there with an audience, preferably one enjoying a lovely picnic. And everyone must be the same gender and should, if at all possible, be dressed in very uncomfortable clothing. After you have wallowed in the flowers, be sure to pick some and stare vacantly into the middle distance. And of course, you should be arrayed in an artfully disheveled white dress. To get that shabby chic look, you know? How you dishevel it is up to you. Never let a gust of wind pass without posing. When it comes to flower-staffs, the bigger, the better. Only travel with an entourage of little people, so as better to accent your royal mien and bearing. Choir boys will also do. Spring is a lovely time for a refreshing dip. You know you’re having a good Spring day when, so enraptured by the little blossoms you’re holding, you don’t even notice your long green scarf blowing away. If you happen to find half-naked classical youths asleep in a garden, surrounded by putti and doves, and stuck in an extraordinarily improbable pose, don’t worry. This is normal in Spring. Likewise, wild nuns emerge from hibernation and range freely again in the Spring. While it’s important to enjoy the season, it’s even more important not to get too caught up in it. This time of the year is when people are most at risk of being sealed into trees by nymphs. But surely the best thing about Spring is that it’s no longer Winter! As the world seems to be reeling towards another horrendous conflict, I am reminded of one of the greatest, most Dionysian pieces of recent anti-war art, Veljo Tormis’s Raua Needmine (Curse Upon Iron). Bleak as the Baltic, majestic as the dark woods of the north, and terrifying as Ragnarok itself, the 1972 piece from Estonia managed to capture the frenzied devastation of war. It is music best listened to with eyes firmly shut.